Finding the best way to display a wine collection while ensuring that your bottles are securely stored has aways been a struggle. Now you can transform your collection into a unique form of wall art with our wall mounted wine rack. 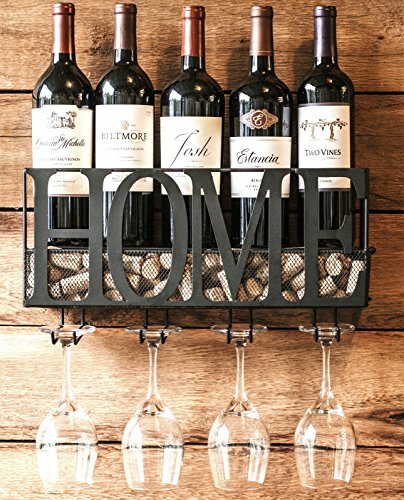 This unique wall rack allows you to display your favorite wine bottles and securely holding 4 glasses. Store each wine cork as a cherished memory. PERFECT GIFT IDEA - perfect elegant gift for housewarming party, birthday, wine connoisseur, etc. SIMPLE TO INSTALL - no assembly required, mounting screws included. DIMENSIONS: 16.5"W x 4.5"D x 8.5"H. Holds 5 wine Bottles & 4 glasses. Color is Black. If you have any questions about this product by MKZ Products, contact us by completing and submitting the form below. If you are looking for a specif part number, please include it with your message.